Huawei launched its P-series in the spring altering the naming pattern so increments come in tens rather than ones. 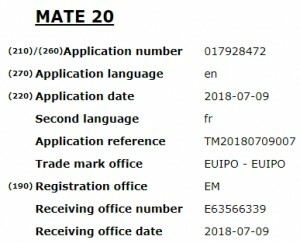 Now its Mate lineup is about to follow suit as the company just patented the Mate 20 name at EUIPO, along with Mate 30, Mate 40 etc. all the way to Mate 90. This means Huawei definitely ditched the sequential numbering and will start counting generations in tenths from now on. According to information from last month, the Huawei Mate 20 is expected to come with 6.9” AMOLED screen that will not have curved edges. The reason behind the growing screen size is apparently the home market of Huawei where consumers prefer big displays more than people elsewhere.